St Petersburg: Apotheca aulica comparations, ad fluvium Fontacka Petroburgae - Almazen de las provisiones de la corte junto a lo rio Fontacka, en Petersbourg. Old, antique copper engraving of St. Petersburg. Remondini, ca. 1770. 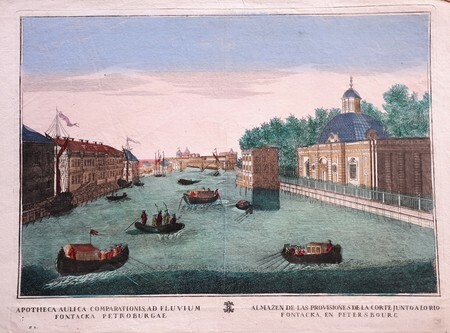 View of the Fontanka, river in the Great Neva delta at the Peter's Great summer palace and branching arm of the river, which flows around the center of St. Petersburg. On the right side you see the cave of Peter the Great (The cave was demolished in 1826 and replaced by a coffee house), and on the other side the storage room for the Summer Palace. Or. col. optical view print. Height 31 cm., Width 41 cm.